Family-owned Henderson Group in Northern Ireland, have been distributing food and grocery-related products to the convenience retail sector for over 100 years. 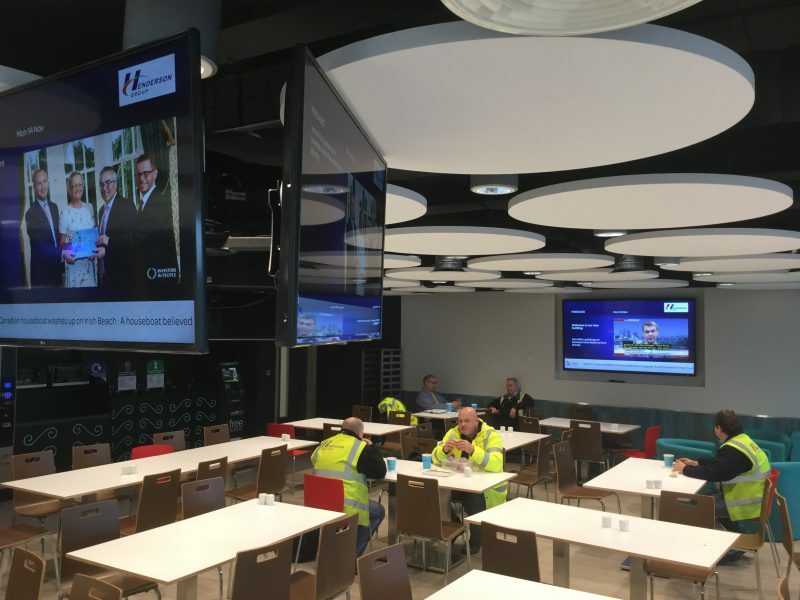 They got in touch with us at Niavac as they had wanted to implement AV services in their Mallusk Headquarters, after gathering requirements and providing a detailed technical solution Niavac were appointed as Henderson’s AV solutions provider. We worked with the building services team to design an overall system that would meet their needs. This included a variety of standard displays, with HDMI / VGA & Audio inputs on custom made floor plates, a number of large interactive displays, in multiple meeting rooms and digital signage throughout the whole building. Barco clickshare is in use across the installation allowing wireless presentation from any of the 4 displays in the canteen. These have the ability to show internal digital signage and also accept a laptop input for companywide presentation purposes. There are a number of pendant speakers for presentation audio together with a wireless microphone for the presenter. After successfully delivering this project Niavac were awarded the second phase which is an extension of the systems described above at a new warehouse facility also located in Mallusk.